PF at the weekend - nobody knew what track conditions would be for any session. This is the new norm for summer karting - dry track with blue sky, and a huge rain storm closing in fast! If you want to feel psyched up with a 'bring it on' attitude, here's some help. Some kerbs that you wouldn't dream of using in the dry are essential in the wet. When you are trying to drive in straight lines you will need to cut a lot of corners. Be prepared to scrape the bottom of your kart and upset the mechanic! Karts are awful when the track doesn't supply the required grip to make the chassis lift the inside rear wheel. You may need to force the kart to work by using the maximum steering lock. Some guys will never have turned the wheel so far, so in the wet dont be afraid to turn the steering as far as it will go when needed. 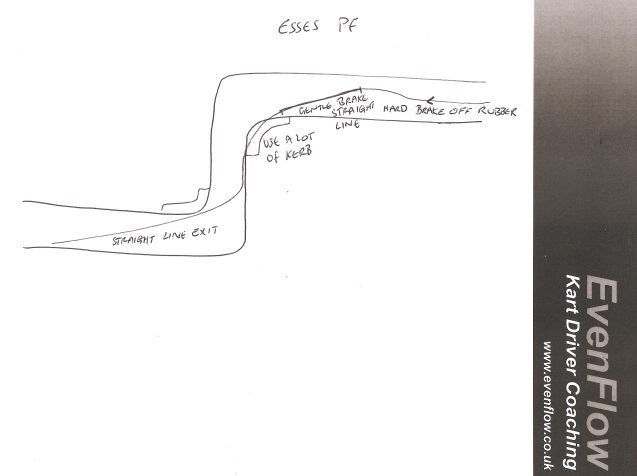 Example approach wet PF 'esses'. Beware, track conditions are organic - nothing is set in stone! Warning - this method takes up to 10 minutes per corner. Also you might get some funny looks because you'll be crouching down and walking backwards a lot! Crouch down so that your view of the track is as it would be when driving, and spot your chosen exit point. Burn this image into your mind because this will be what you'll be locking on to while you suffer 2 G loads, with scenery flashing past and other lunatics attempting to fire you off. Now you know the critical points of that corner in real world terms better than anyone else who doesn't bother going through this procedure. This will give your subconscious critical information and free up processing power to make you drive faster! But don't stop there, walk forwards toward your corner keeping an eye on your apex. Now we are looking for peripheral markers. These would be braking indicators, and cornering marks that keep you clued up that you are positioned correctly as you drive the corner perfectly. Pick a braking indicator. I say indicator because braking points change according to grip, and you'll only use it with peripheral vision. Typically there will be marks left by locked tyres, or marshal post in braking areas. Look for an indicators for turn in point, when to get off the brake, get on the throttle and where you expect to reach full throttle. These indicators are luxury items that you will notice with peripheral vision. When you hit them with the correct inputs you'll get a feeling of confidence that things are going to plan. This is the detailed feedback that can put you in the zone. This is the serious driver's approach to mastering a corner. It takes time and effort and will set you apart from every other driver on the grid. If you want absolute confidence that you will ace each corner every time, you need a detailed plan of how you will take the corner.....otherwise how will you know you got it right? This is a methodical approach that is far superior to what everyone else does, which is to drive round all day randomly changing their driving hoping to find the sweet spot - if they are lucky they will hit a sweet spot but likely forget it! You however will have it all written down and burnt into your mind. 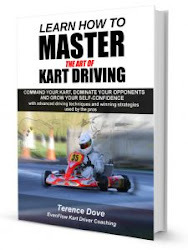 My drivers use diagrams with colours and a few clever tricks that they can recall in a flash before they approach each corner, they then feel absolutely confident of how they need to take the corner. Once they have driven the corner a few times they start hitting all their points on autopilot. That's when they start to experience flow and a feeling of being in the zone, because they are able to continually measure how close to perfect they take each bend (being in flow depends on getting high quality feedback continuously).